My final post from Switzerland covers the rest of the wildlife seen during our trip, including two mammal species that are a defining feature of that stunning landscape. 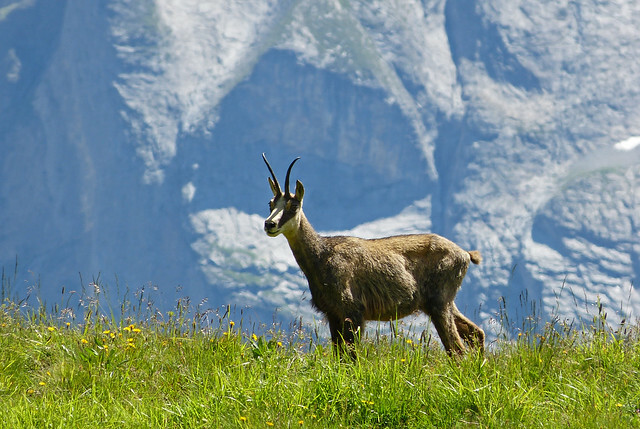 The first of these is the Chamois, a goat-antelope animal that's native to the Alps and is probably best known for the car cleaning leathers that are traditionally made from its hide. Being very smooth and absorbent makes it an ideal material to use on delicate paintwork, but demand along with their tasty meat has led in recent times to a severe drop in numbers. By the end of the nineteenth century the situation had become so perilous that the Chamois was on the brink of extinction, an outcome thankfully avoided by the introduction of a new hunting law in 1875. Since then the population has slowly recovered with current estimates putting alpine numbers at around 100,000 individuals. Hunting still continues under heavy regulation, so as you can imagine it's not all that common to see one in the wild. At least that has been the case in the past, but this year we seemingly couldn't stop finding them! Our first pair were sighted at around 3,000 meters near Grosse-Scheidig. A small area of the slope still held snow and it was around this that they seemed to be feeding. I took a few distant record shots (at that time we didn't actually know what we were looking at) before moving on. Following the path around the mountain we soon spotted another or the same pair in a slightly different area. They were a little closer though so I again took a few record shots but the heat haze and distance were always going to diminish quality. At this point you may be wondering why I haven't included any of these photos yet, even if just for illustrative purposes. There is a very good reason in that a couple of miles and a huge climb and descent later, we spotted a herd of six or seven Chamois a little way ahead. As we got closer they milled around but stayed in the same general area until to our utter disbelief we found ourselves surrounded. My camera quickly fired into action and it is those photos that I shall now present. To see such a rare mammal at close quarters and in good numbers simply blew me away. Mid way through our encounter a stilted exchange with a passing French couple had identified them as Chamois for the first time, a realisation which only enhanced our excitement. But why were they behaving like this and not simply running away? My best guess is that the herd had become split into two on either side of the path and were unwilling to move on without the rest of their cohort. This situation was only exacerbated by the presence of young within the group. As we stood still a few individuals crossed the divisive path just in front of us until the herd was once more complete, the trigger for them to continue on their way. Although this was the only photographic encounter I had with the Chamois, it was by no means the end of our sightings. We saw a single individual feeding on improved grass behind a house in Murren of all places, and picked out four or five individuals on crags from the Schilthorn cable car. 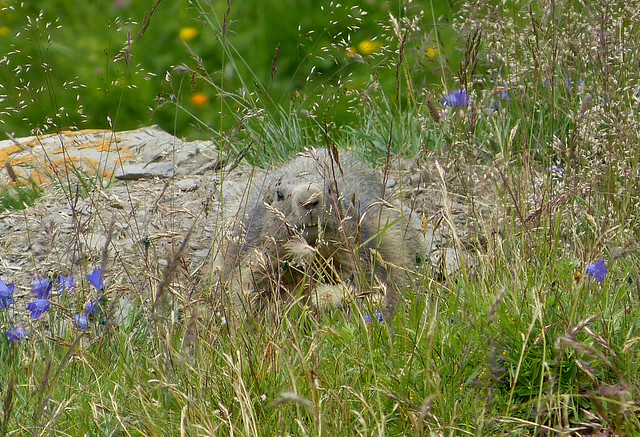 The second mammal star is of course the Alpine Marmot, a burrow dwelling ground squirrel that I challenge anyone not to love. As they sometimes spend up to nine months of the year hibernating your only real chance of seeing them is during the summer, and see them we most certainly did. 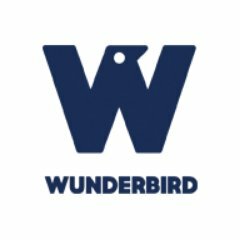 Our first sightings were from the cable car between Grindelwald and Mannlichen and served as an excellent reintroduction to a species I had last seen over fifteen years ago. In that time I'd forgotten just how large they were, and indeed quite how loud their calls could be. It was that volume that alerted us to their presence on numerous occasions throughout the region. We got out best views though on the walk from First to Bachalpsee where our attention was initially taken by a pair some distance away on a grassy bank. A slight movement much closer alerted me to a third individual which had just popped its head out of a burrow and was proceeding to eye us up. It stayed like this for a couple of minutes before deciding that we weren't worth the hassle and that its burrow was a much more attractive proposition after all. 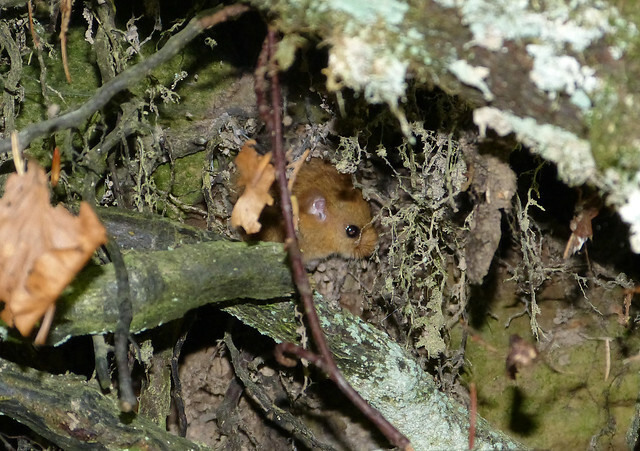 On a smaller scale still was my first ever Dormouse at Harder Kulm. I spotted this tiny creature hiding under some overhanging tree roots and we were all treated to some great views. Sadly great isn't the word I'd use to describe the following photo, but at least you can see what it is. 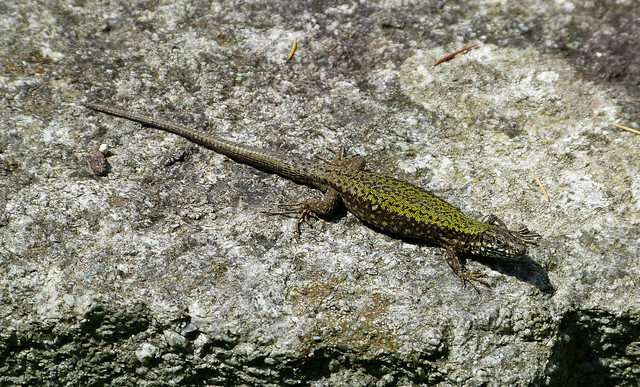 Moving away from mammals it's reptile time with a couple of Wall Lizards sunning themselves at Oberhofen Castle. 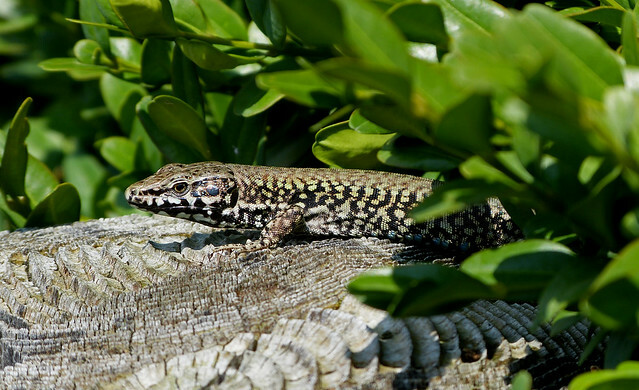 These seemed larger and, in the case of the green individual at least, more colourful than our Common Lizards here in the UK. They were however just as nervous and under the baking sun lacked no energy to dart into cover at the mere hint of an approach. The final story I shall share before bringing this particular piece to a close concerns the camp site where we were staying. Early one morning I was awoken by Emma who thought she could hear snuffling and was concerned that an animal had made it into the caravan. Playing the part of the concerned boyfriend I obviously told her to be quiet and went straight back to sleep. In the morning however we found the grass on ours and the neighbouring plots dotted with small shallow holes. It would appear that there had indeed been a visitor during the night. Of course the next question was what could it have been? Badgers were out as the holes were simply too small but we did have two possible candidates. The first was one of the Black Squirrels that Emma had seen in the surrounding woodland, whilst the second was a Pine Martin of which one had been reported on the nearby stream. Of the two I consider Squirrels more likely but we may never know for sure. Even leaving some bread and jam out the following evening couldn't entice whatever it had been to return. 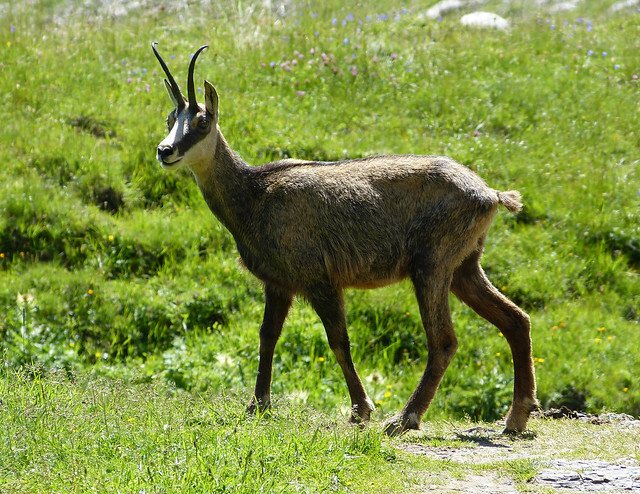 Pretty animals you found in Switzerland, especially the Chamois, superb. Good to know the Chamois are beginning to do well. 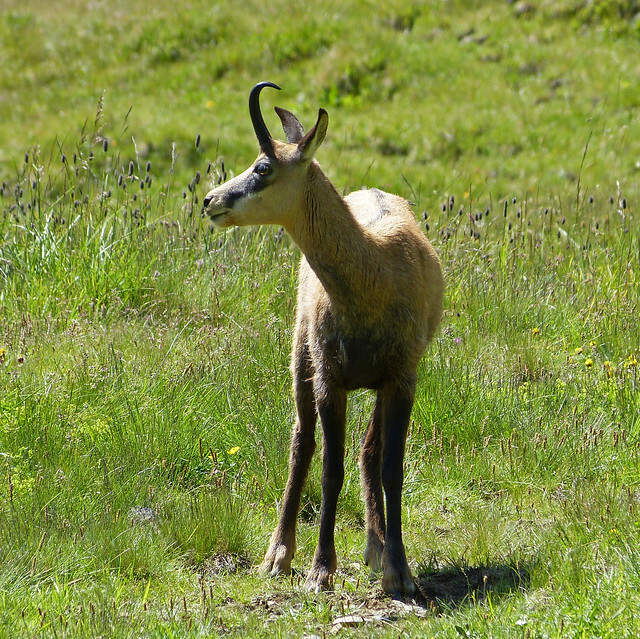 Some great animals you saw on your Trip Adam...the Chamois is a beauty for sure! I also love the lizards. Thanks all. Glad you enjoyed the Chamois.